Crunchy on the outside, fluffy on the inside... which restaurant nailed that formula? 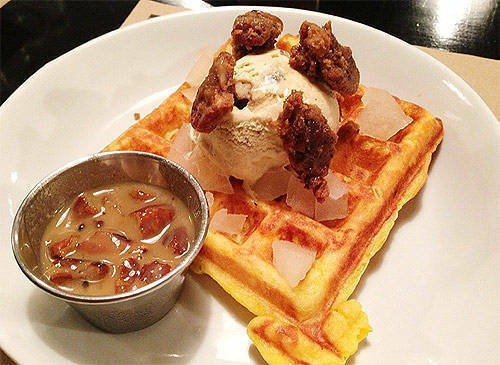 (SPOT.ph) It's not molecular gastronomy, but a waffle can be a bit tricky. It can mean different things to different people, for one thing. While it was the ancient Greeks who originally started cooking flat cakes between hot metal plates, it wasn't until the 13th Century that they started being stamped with various designs. 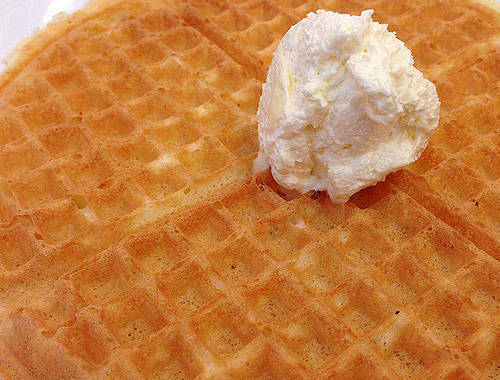 The Dutch were the ones who started calling them wafles, and today, there are several different types in Belgium alone. 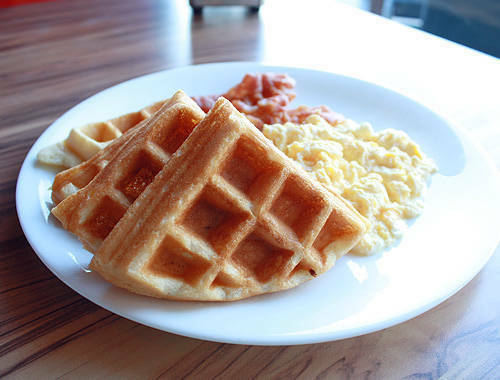 But the most common waffle in Manila is the kind you have for breakfast, defined by The Nibble as "A light, crisp battercake made of flour, sugar, eggs, and fat, baked in a special appliance that leaves a grid pattern of honeycomb-inspired squares on both sides." It's simple enough that it can be subjected to experimentation and embellishment, but we went in search of the ones that did the waffle well-from a distinct, subtly sweet flavor to a definite crunch. Here are our picks. It's a go-to place for breakfast fare, and the Golden Brown Waffle is, as expected, a pretty straightforward version. We like that it's crunchy on the outside and light and airy on the inside, though the flavor is very mild and highlighted only by the creaminess of the whipped butter. We wish the syrup were less one-dimensionally treacly, but as quick fixes go, Pancake House is a safe bet. While this waffle is mostly soft, with only a faint crunch in some parts, they got the basics right. It has that slight sweetness reminiscent of the Saturday mornings of your childhood, when a waffle would be an extra-special breakfast treat. The scrambled eggs and bacon served on the side add a couple of extra servings of cozy, down-home comfort. You can't beat the accessibility. 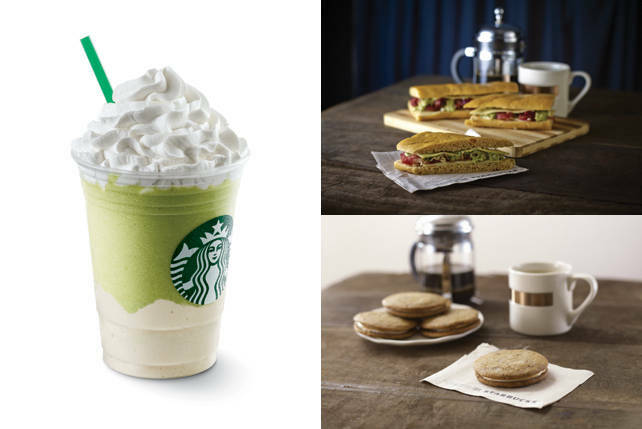 With a Starbucks (sometimes, more than one) on nearly every major street in Manila, they're the easiest and quickest option when it comes to giving in to a sudden waffle craving, but be warned: the waffle is good enough to cause cravings in the first place. It doesn't look like a lot, being no bigger than a small plate, but it packs a lot of flavor: the waffle itself is buttery enough to resemble a croissant's distant cousin, with bits of sugar adding crunch but not too much sweetness. It's served smothered with whipped cream and your choice of chocolate, caramel, or strawberry syrup, but dig through it all and you'll find that the waffle really doesn't need all the embellishment. 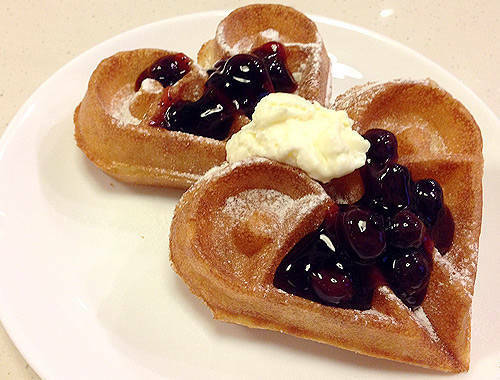 It's cute, yes-how else does one describe any type of heart-shaped food? But there's more to it than just plain good looks. Red Mango's waffle is more crispy than crunchy, mainly because it's so light inside that it almost seems hollow. It also tastes faintly savory, which is the perfect complement to the toppings available: Blueberries and Cream, PB Chocolate Chip, Banana Almond, and Green Tea. You know they’re whipping up a fresh batch of waffles at Apartment 1B when a sweet and comforting aroma floats out of the kitchen. 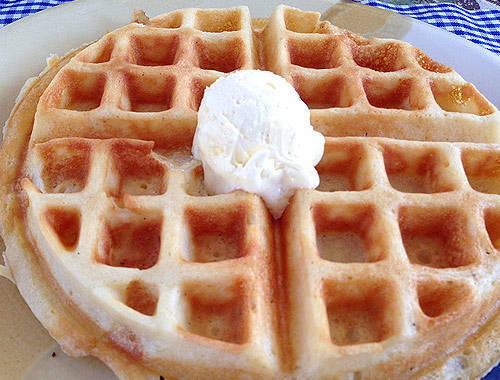 The waffle itself is just as simple-soft and not too mild, but not too sugary. The sugar comes from the mixed berries served on the side. It doesn't look like much, but by the time you've polished off your plate, all you'll be left with is the feeling that you wish there were more. We were initially convinced that Chelsea's Classic Belgian Waffle was imaginary-after months of asking for it at their branch in The Podium and constantly being told that it wasn't available, we went to the Serendra branch and finally got to try it. The upside: it was worth the runaround. The waffle, though not very crunchy, isn't soft or soggy. Sprinkled with powdered sugar and cinnamon and flavored with just the right level of sweetness, it might remind you of Mexican churros. Melted butter and thick maple syrup are served on the side, but the waffle can do without. Whipped cream gives it a fresh, light creaminess. The name alone was enough to get our appetites interested, and we were happy to not be disappointed. 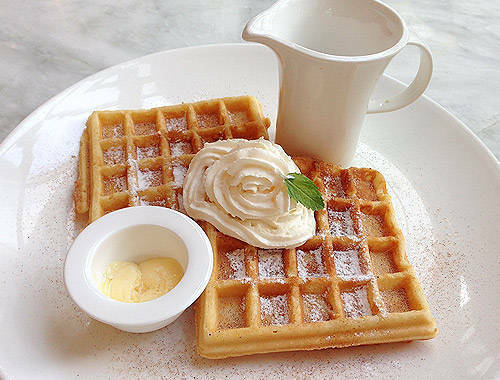 The Crispy Waffle at Rustic Mornings is indeed crispy, with a satisfying crunch on the outside while staying amazingly soft on the inside. It tastes buttery but not overwhelmingly so, and while their pancake syrup is good, the waffle can do quite well without it. The whipped butter that tops it off adds a subtle sweetness to this thick-but surprisingly not too heavy-breakfast treat. 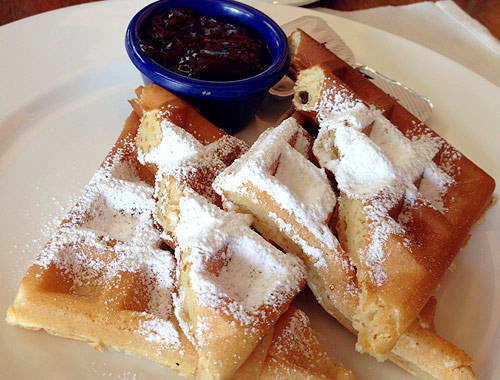 Balboa has one of the heftiest servings of waffles on this list, and also the most satisfying. 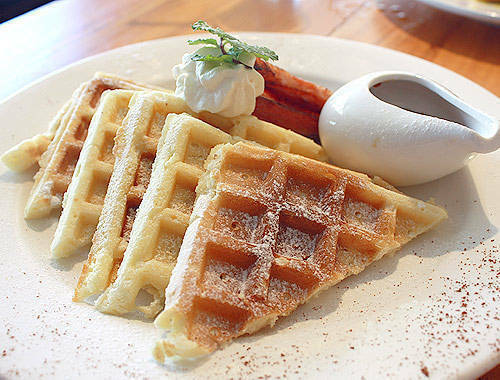 Their waffle is slightly sweet and not too doughy-actually quite thin, so it's pretty light. It's served with a house-made, vaguely gritty salted caramel sauce that nonetheless adds to the waffle, both in texture and flavor. While the waffle is fine on its own, it shares the spotlight with the sides: caramelized apples and a slab of perfectly cooked bacon steak that's just the right size. 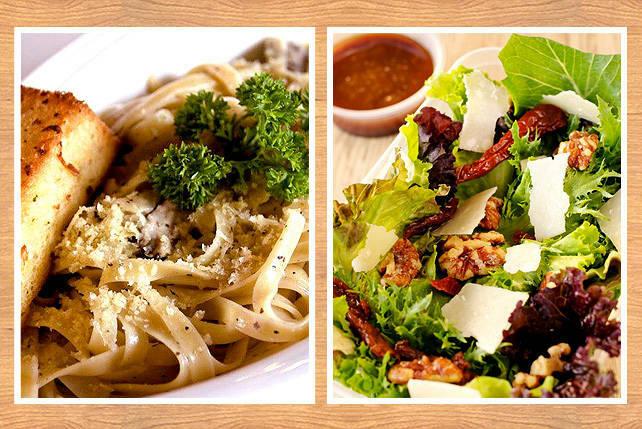 Balboa is at the East Wing, Shangri-la Plaza mall, Mandaluyong. This waffle is crunchy at the edges, moist and doughy inside. Pumpkin adds depth to the flavor so that you'll want to savor it on your tongue, and the candied pecans add just the right hint of saltiness. While the cubed pears at first seem to be a mismatch, they provide additional texture and freshness so that all the elements don't end up becoming too cloying. 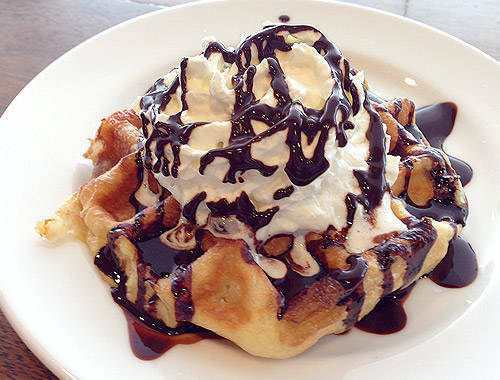 We suggest requesting that the ice cream be served on the side, to keep the waffle from getting soggy. 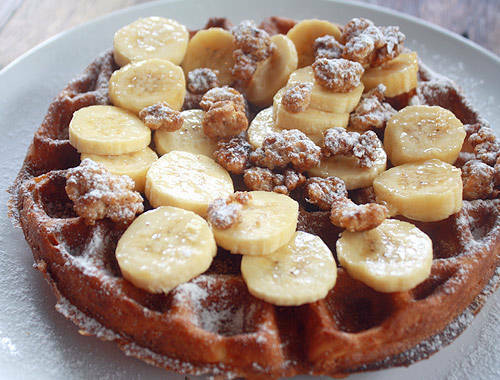 Wildflour's waffle is darkly toasted, sprinkled with powdered sugar and topped with banana slices and candied walnuts. It gives a satisfying crunch whenever-and wherever-you slice into it, but the inside is perfectly soft, almost fluffy. 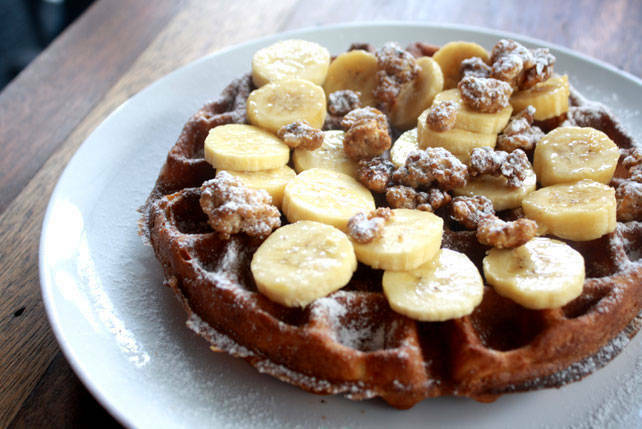 While their syrup is the real thing (none of the "maple-flavored" kind here) and the candied walnuts are good on their own, both are really just an extra kick of sweetness if you want one, because the waffle's delicately buttery flavor needs no extras.